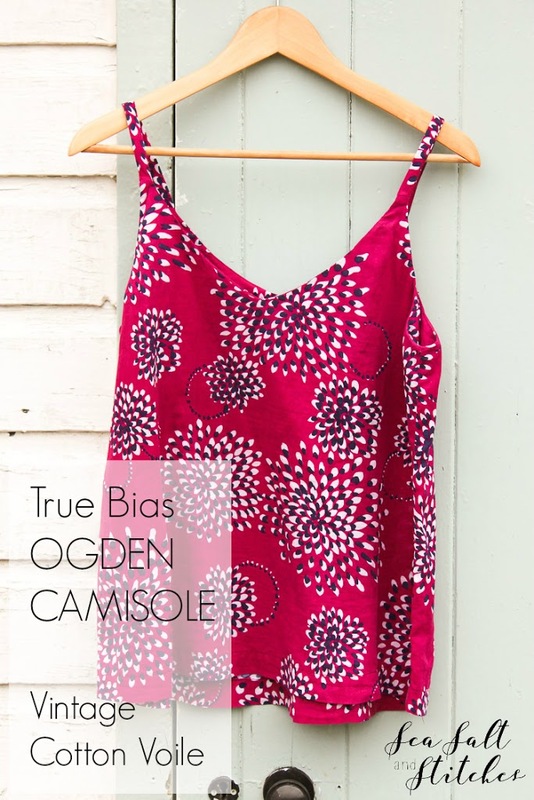 If you have been following my vlogs on YouTube, you will know that I have a bit of a soft spot for a certain camisole pattern – the Ogden Camisole by True Bias. So far I have made three (plus a toile) and I have plans for many more. For quite some time I have been wanting to find a camisole pattern which didn’t need to be cut on the bias and ideally with bust darts. 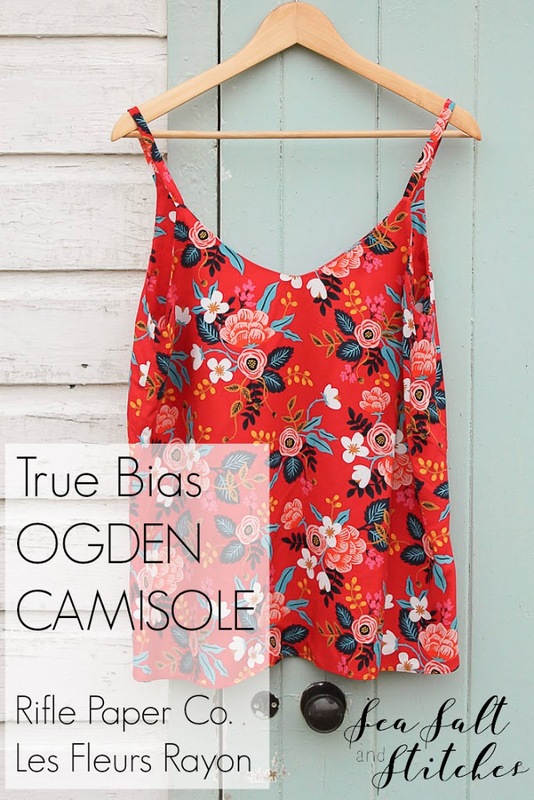 Although the Ogden doesn’t have bust darts, it does have a beautifully shaped neckline and a lovely large facing (nearly a half lining actually). I may be in the minority here, but I’m not really a fan of the finish of bias binding on either a neck line or armscye. However, I certainly understand the appeal because facings can be very annoying if they keep trying to flip out when wearing your garment. That is why the extra long facing on the Ogden is so lovely – definitely no chance of the facing creeping out. The Ogden is also cut out on the straight of grain, and even with the large facing and a bit of lengthening (I’ll get on to that in a bit) you can still squeeze one out of a meter of fabric – a total win in my book because I have accumulated quite a stash of 1m cuts of beautiful fabric that were rather pricey and I was too stingy to buy more of (Liberty Silk, I’m looking at you!)! 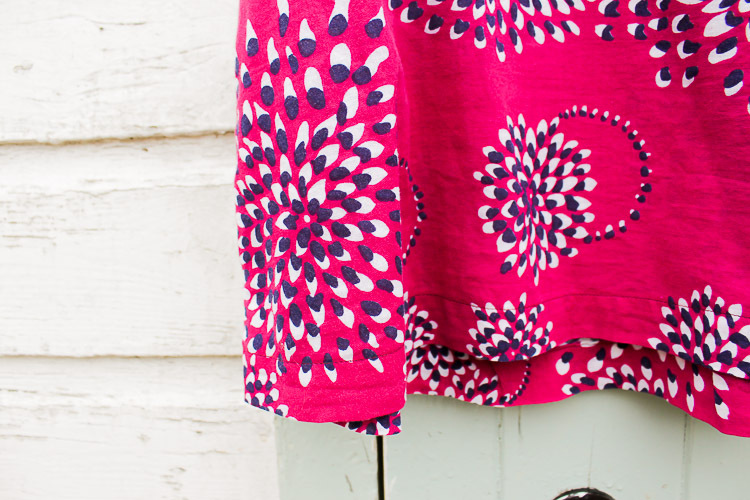 The first Ogden I made is out of a lovely magenta cotton voile which I had had in my stash for years. I’m afraid I can’t even remember where I bought it from! 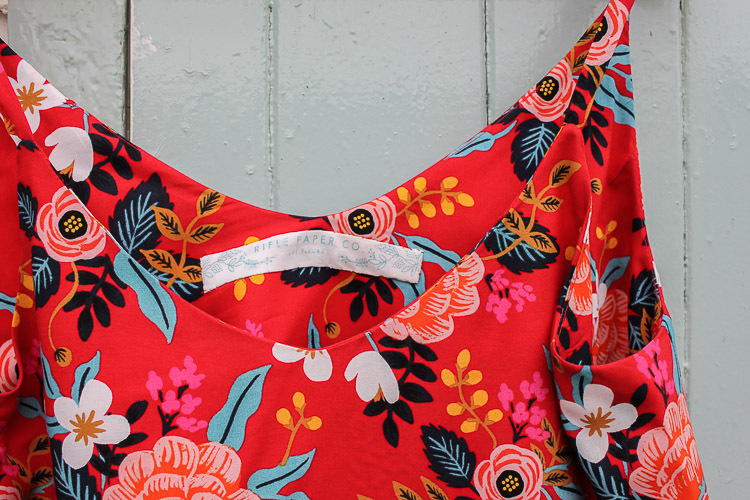 My main reason for using this fabric for a camisole is actually because I had some left over from making a maxi dress earlier in the year (and I’m sorry, I never got around to blogging about it! You can see it in this vlog though if you are interested). 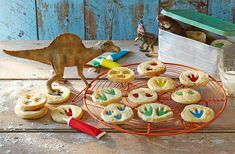 So that is another awesome bonus about this pattern, it’s a great one for using up your remanent pieces which you can’t bring yourself to throw out! I don’t think I made any adjustments to this version, although I may have lengthened it slightly. The original pattern is for quite a short camisole, which would be perfectly fine for tucking into high-waisted pencil skirts and the like. I, however, knew that I wouldn’t really be doing that so all my versions are lengthened to allow for a more flattering length (on me) when worn untucked. 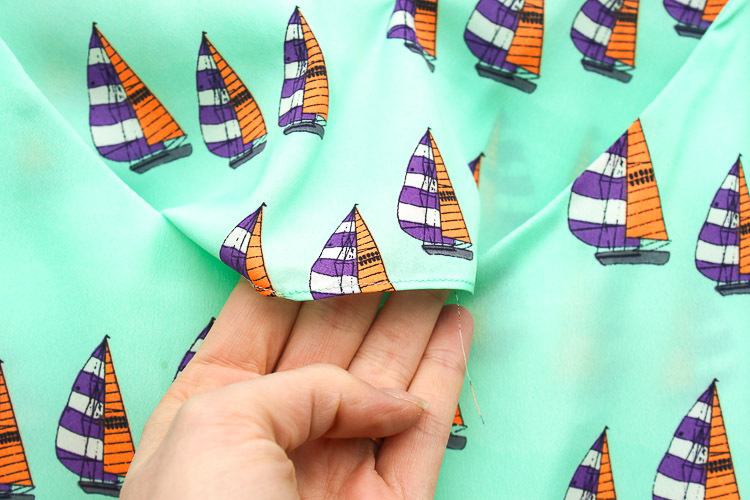 I did give this version a very nice deep hem, which I think worked really well with this voile. There are just a couple of things I’m not so keen on with this make; the fact that I really cannot tell which is the front and which is the back, and the lack of bust darts. I suppose if the front and back are nearly identical, then it doesn’t really matter if you wear it back to front, does it?! As for the lack of darts, in this cotton voile it does mean that the top sits out a bit from my body and ends up looking a little boxy. 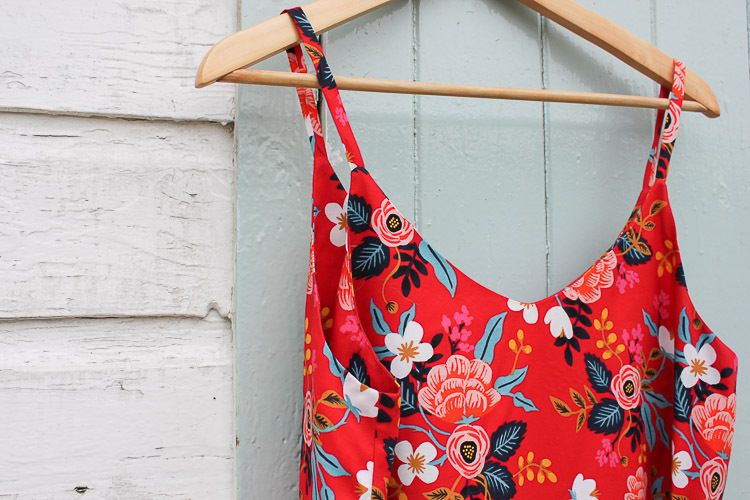 Over all though, its a lovely light camisole, perfect for throwing on in the Summer time (I write, as a gale blows outside and the rain is beating on the window! Oh Summer….I miss you….). My second Ogden is made out of a beautiful silk which I bought from Guthrie and Ghani last year. I’m afraid they don’t have it in stock anymore. This is an example of one of those 1m purchases I mentioned earlier. The colours are a bit out there (the orange is nearly fluorescent!) and I know it wouldn’t be to everyones taste, but I am just a sucker for anything nautical and couldn’t resist getting a bit. I didn’t know what I was going to make at the time of purchase, but obviously it was going to be a top as 1m of silk doesn’t really lend itself to much else really! 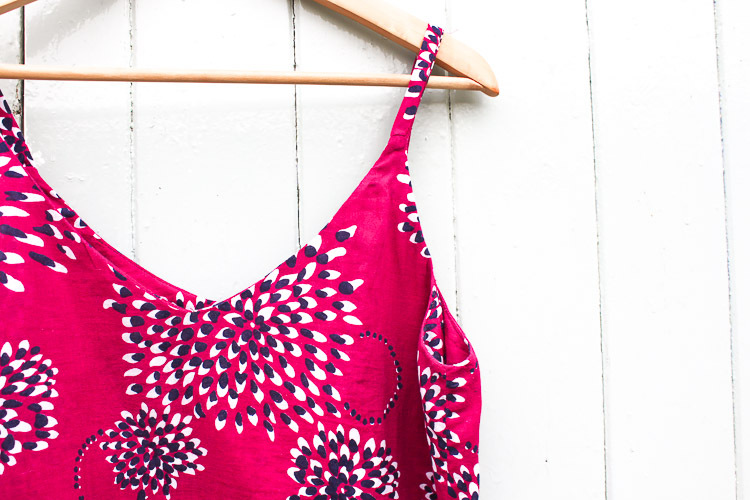 The Ogden pattern is perfect for a soft, drapey silk such as this because the drape of the fabric means it hangs in a flattering way on your body, even with the lack of darts. I was a bit nervous cutting into and sewing up this fabric, for fear of it misbehaving, but actually it wasn’t very difficult to work with. I have heard of people using various different methods of stiffening light fabrics to make them more compliant to sew with, and I did toy with the idea…but to be honest, I’m impatient and couldn’t wait to 1. buy the necessary items to do that and 2. I wanted to make my top ASAP! I used my rolled hem foot on this make, as you can see above (please excuse the rouge thread…note to self: make sure you go back and trim that!). This is actually one of the first times I have used that foot, and I have to admit, I love it! It takes a fair bit of fiddly practice but once you get the hang out it, it really does produce the most beautifully neat and tiny hems. The only thing is I haven’t quite got the handle on how to deal with going over seams…so I still need more practice! Speaking of seams, the insides are finished with French Seams, which I thought would be the only seam treatment worthy of a beautiful silk. I also made a conscious decision about the visible pattern on the straps – meaning that I know there are two sailing boats visible on the front of the right strap, and I therefore know which is the front and which is the back of the top! The only thing I am struggling with is what on earth to wear this top with! I like to layer my camisoles under cardigans but I don’t have any in any of the colours of this top. Well, I do have a dark purple, which is what I reach for at the moment, but to be honest I don’t love the pairing. So that’s something for me to think about. I also realised, after the top was complete, that the fabric is a bit shear and I shouldn’t have used self fabric for the facing, because you can see faint outlines of sailing boats peeping through along the bust area. A bit of a shame, but at the same time, I’m not going to lose any sleep over it. Just a lesson really, and something to remember for future makes. And finally, we have one of my favourite makes ever. My Ogden made out of the beautiful Rifle Paper Co. Les Fleurs Rayon in the Enamel colour way. 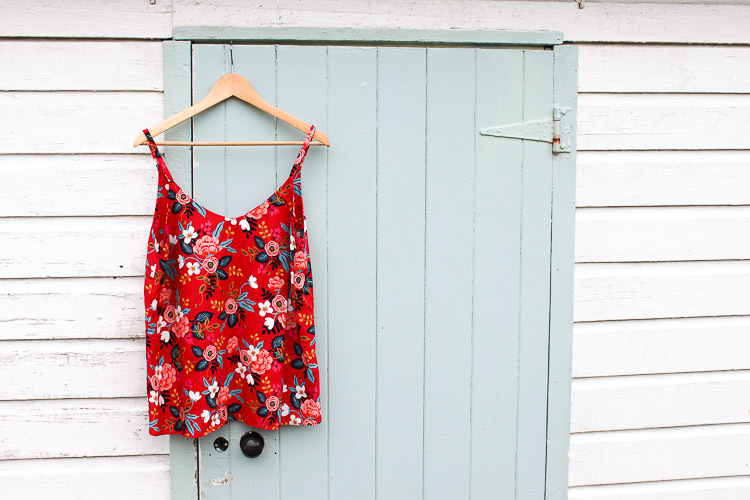 I have all the heart eyes for this top, it is just so beautiful! I was rather nervous cutting into this fabric too, because I just love it so much and I was worried about messing it up. But thankfully all went smoothly and I ended up with a camisole I am very happy to have in my wardrobe. I used French Seams on this top as well, and also finished off the hems with the rolled hem foot. The fabric pressed really beautifully and was pretty easy to work with. Again, I lengthened this version, probably by about 5cm. 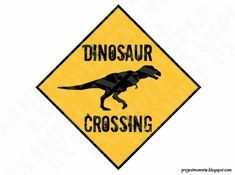 While I was making this version I decided to add a label to the back facing to make it very easy to distinguish the front and back. The selvedge of the Rifle Paper Co. fabric was so beautiful I thought it would be lovely to use this as the label. It’s probably a little bigger than I would necessarily want a label to be, but I was keen to show as much of the pretty design as possible and you don’t even notice it when wearing it. 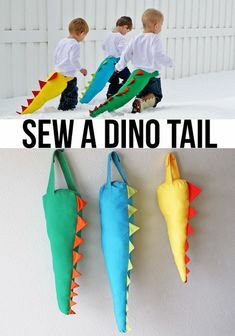 It will be a lovely reminder in years to come of the fabric I used. I just sewed this in by hand. By the way, its actually straight, but the way the camisole was hanging in the above picture makes it look like the label is arched! Again this fabric is perfect for the Ogden, as it drapes so beautifully without the need for bust darts. The only thing I don’t like is that it actually crushes very easily…which means you need to iron this top before every wear (boo!). 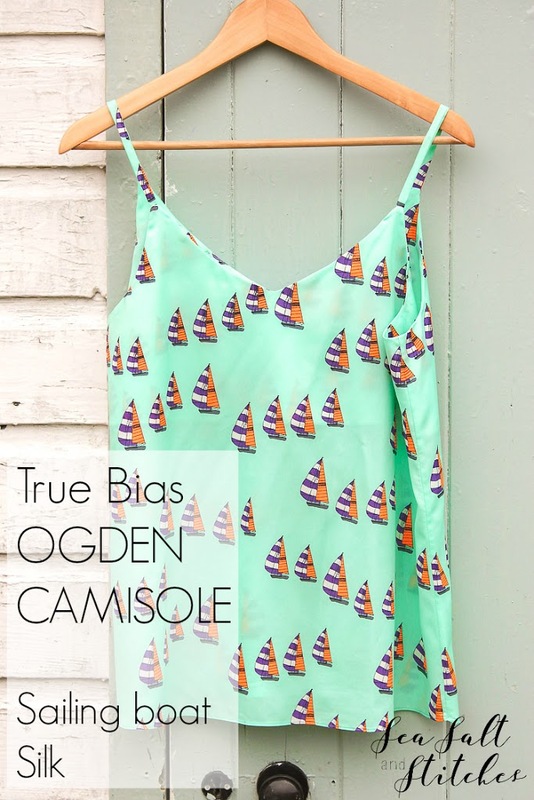 I also love love love the ogden and have four: two camis in silk and two in quilting cotton (for pajamas–a good use of cozy, cute, not 100% flattering yard lengths of cotton, FYI! 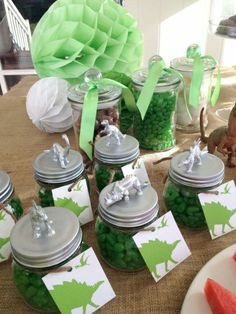 )… now I want to make a few more! Oh that's so true. 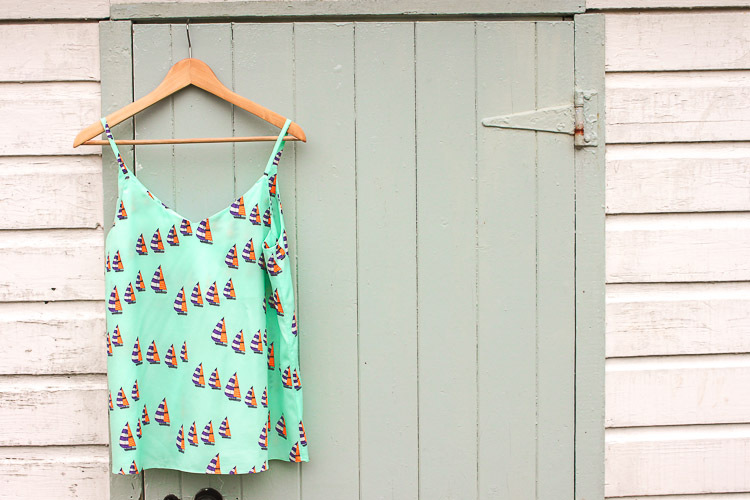 I have a few pieces of fabric in my stash that would be perfect to turn into PJ tops – good idea! Thanks for the link to True Bias. 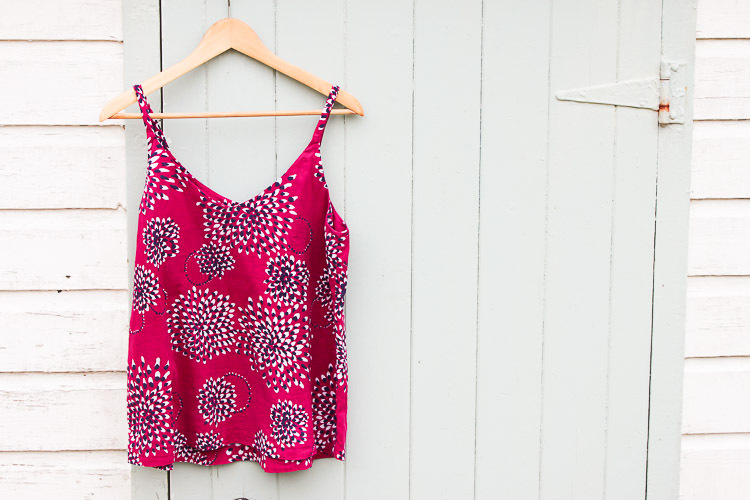 I love this cami – delightful. I have been ogling the Ogden for ages now but the lack of bust dart worried me, it's nice to know that if I pick a very drapey fabric I should be alright. I love all three versions youve made, the fabrics are gorgeous. I finally succumbed and bought the Ogden pattern.. 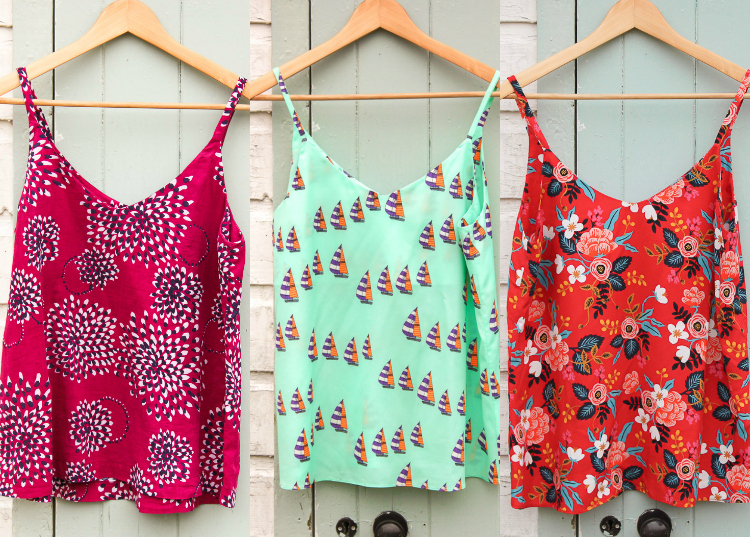 I'm in need of some lovely came tops ASAP, and will be making many I'm sure! Yours are gorgeous!